One minute you're hanging out with an old buddy, having a few laughs, playing a nice friendly card game, and the next minute you've gone and lost your coolest spaceship. You've stewed about it, probably. You might even have spent some time thinking about how you'd get back at that slimy, double-crossing, no-good swindler who took it, right? Maybe you'd dabble in a little carbon freezing, some bad deal making, there might even be a bounty hunter. Who knows. My point is, what would you do if you ever got the chance to fly that spaceship again? You'd barrel through the metal guts of a Death Star, shoot out the core, and very nearly get yourself killed escaping, right? Bear with me here, because despite the completely fictional picture that I've painted above (any resemblance to actual events, locales, galaxies, or droids, living or dead, is entirely coincidental) I'm actually only really interested in that last bit, the escape. The escape and the consuming fire. For me, 2015 was the year I had just had it with feeling like I was just barely escaping the Death Star, over and over and over. I've been at this full time business of illustration for a decade (last May marked 10 years) but 2015 was the first year I took steps to purposefully consider my pace. So often while juggling projects over the last several years I'd had this almost claustrophobic feeling that I was strapped to the Millennium Falcon, hurtling through the dark and narrowing corridors of the Death Star. Sure, I'd lose a radar dish here and there but I'd make it out one way or another, right? Mostly. Too often I'd been trading on my health, sanity, and relationships. It's terrifically easy to burn yourself out if you don't watch it. Burn yourself out in the flaming death of the Death Star, perhaps. That image sums up so much for me. It's this sense that you particularly feel in freelance, that you've got to stay ahead because there is no guarantee what the future holds. This feeling that you've got to give it everything, every day. Gunning it through the dark passages at 0.5 past lightspeed. It's brave and admirable but you can only do it for so long without refueling, or crashing. It's that less often talked about side of things: pace. This nicely coalesced into the space of a single tweet for me the other day when I saw this by Kazu Kibuishi. 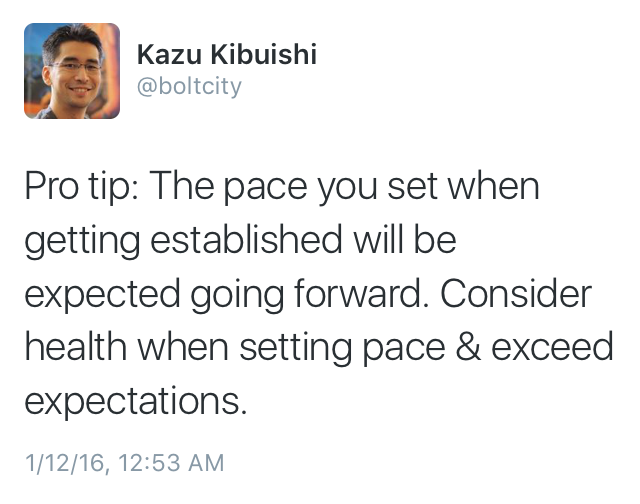 And to quote Kazu's production assistant, Jason Caffoe: The pace at which you CAN do something is rarely the pace at which you SHOULD do it. If you'll permit me a single Star Wars-less analogy, freelance illustration can often feel like you're conducting a train, while simultaneously running ahead of it and laying the tracks (while also shoveling the coal). I felt the cost of that just about this time last year when I hit this crushing malaise. I have no better way to describe it. Some of it was too many projects, some of it was feeling stalled with my personal work. Without realizing it I had nearly drained all my fuel cells, including my reserve tank. My unhealthy pace caught up with me all at once and it took some serious steps to refill the well. See, my previous post on Iceland. I like to run. I'm not great at it but I've done a handful of 10Ks and I typically do a a couple miles a day. Or every other day (pace, you see). But back when I first began running I was constantly discouraged because I couldn't keep it up running full tilt. I thought that was running, to sprint, to give it everything and run your heart out the whole time. It wasn't until I uncovered the magical world of running intervals that I began to improve. In the last year I've gone from struggling to run a full mile without walking, to running a couple of 10Ks at my own pace. No, I'm not all that fast but I try to be consistent and steady. It took time and effort to find a pace that worked for me. At the beginning of 2016, it's worth taking a step back to examine your pace. What did this look like for me last year? It looked like not taking every single good project, even though saying no is hard. It looked like compartmentalizing my studio time, separating the administrative from the creative so that I could better focus on each task. It looked like prioritizing exercise and my health, and not feeling guilty when I stepped away from my work to enjoy other things and people. Consider your pace. Let's make sure we get you out of that Death Star alive and get you to an Ewok party. Unless you live on Alderaan. I guess it depends on your point of view. A certain point of view.